their fourth annual Project Yellow Light college scholarship competition. Project Yellow Light is a national contest and scholarship program that calls on students to create short videos educating their peers on the dangers of using mobile devices while driving. According to a 2013 NHTSA report, 10 per cent of all drivers aged 15-19 years old involved in fatal crashes were reported as distracted at the time of the crashes. This age group has the largest proportion of drivers who were distracted. To further the reach and impact of the peer-generated content, NHTSA has partnered with the Ad Council to turn the winning videos into public service advertisements, which will be distributed to more than 1,600 media outlets nationwide. "Distracted driving is deadly and young drivers are most at risk, so we need to make sure they get the message," said NHTSA Administrator Mark Rosekind. "The Project Yellow Light contest, which uses peer-to-peer messaging, demonstrates how creative public awareness efforts can reduce distracted driving on our roads." "We're thrilled with this year's contest; we had a record number of participants from all over the country," said Julie Garner, Founder of Project Yellow Light. "All of the students produced top-notch films and are doing their part to save lives. I couldn’t be prouder of the youth and their effective efforts to stop distracted driving." Winners were selected from two age categories: high school juniors and seniors, and college students. The high school grand prize was awarded to Marlowe Lexvold of South Haven, Minnesota. The college grand prize was awarded to brothers Sam and Wrenn Senser from South Bend, Nebraska. The winning videos can be viewed here. Second and third place prizes were awarded to high school students Aneyza Clark of Dallas, Texas, and Ryan Robert Reid of Fairburn, Georgia, and college students Lindsey Brown of Culver City, California, and Tiago DeSouza of Hagerstown, Maryland. In addition to seeing their videos turned into PSAs, first place winners will receive US$ 5,000 in college scholarship funding. Second-place and third place winners were awarded US$ 2,000 and US$ 1,000 scholarships, respectively. All scholarships were provided by Mazda Motorsports. U-Haul will also provide both first place winners with up to US$ 2,500 in moving expenses. 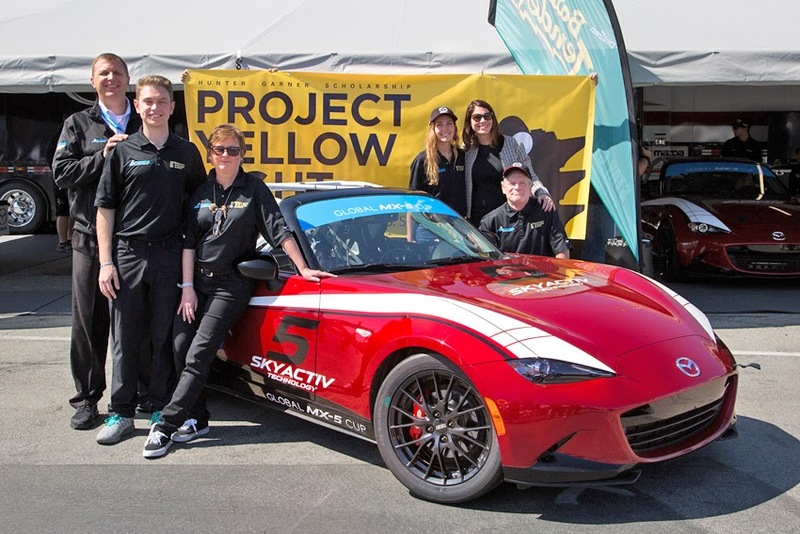 "Teaming up Project Yellow Light with our young Mazda racers has been a great match. The creativity of the students matched with the courage and conviction of our racers gives us two paths to share the message of the dangers of distracted driving. We've been very impressed with how Mazda racers like Ben Albano, Kenton Koch, Tristan Nunez, among many, have embraced this program. Their efforts are a clear example of Mazda's Drive 4 Good efforts in the local, regional, and national marketplace," said John M. Doonam, Director, Mazda Motorsports Mazda North American Operations. Ben Albano, a Mazda racer, who started a karting event in his hometown that raised US$ 4,500 for Project Yellow Light, was among the judges. This year's contest ran from October 31, 2014 through March 17, 2015 and received nearly 600 submissions. Established in 2007, Project Yellow Light was started by Julie Garner of The Martin Agency, in memory of her teenage son Hunter Garner who was killed in a fatal car crash. The annual competition aims to encourage young adults to be safe on the road, and generate education and engagement around this issue.